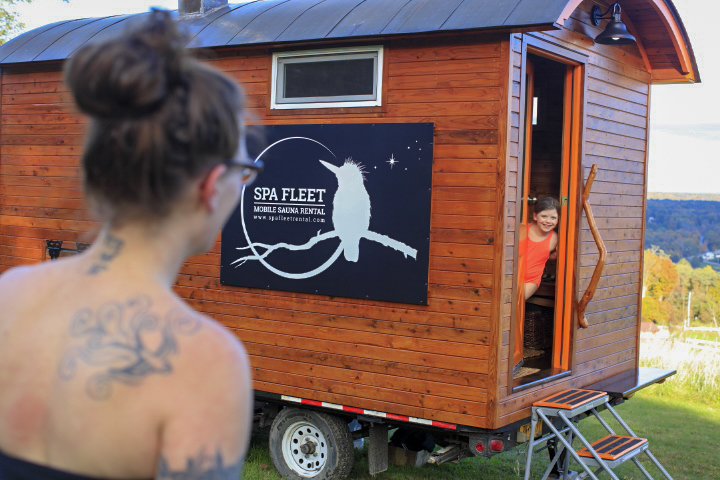 Spa Fleet is a mobile spa rental business, which is based in the Mid-Hudson Valley and serves the Catskill Mountains, the tri-state area of New York – New Jersey – Connecticut, and beyond. 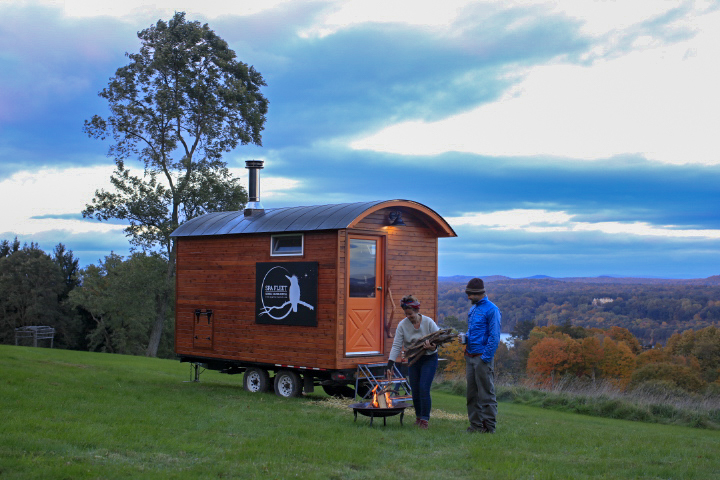 Our Finnish-style sauna Cloudberry is ready to go on the road and meet you at a location of your choice. 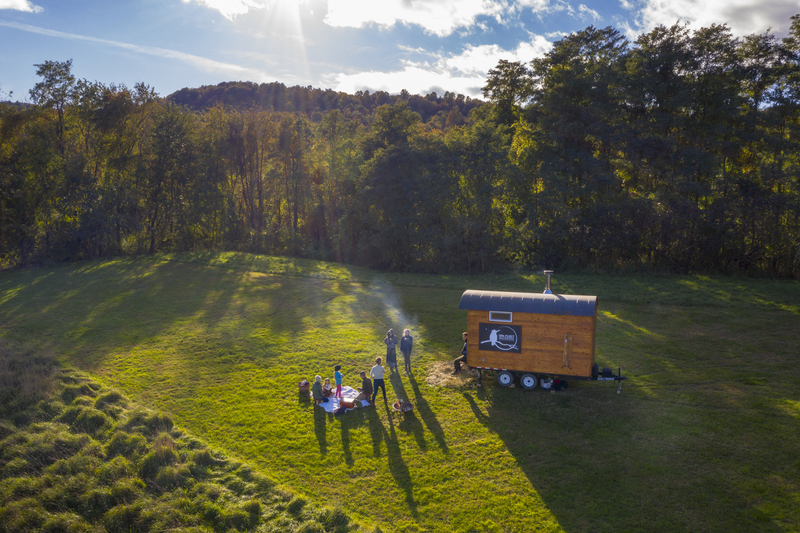 Enjoy this unique and luxurious experience with your loved ones, business associates, and retreat attendees, or book our facility as an add-on feature for your vacation rental home. 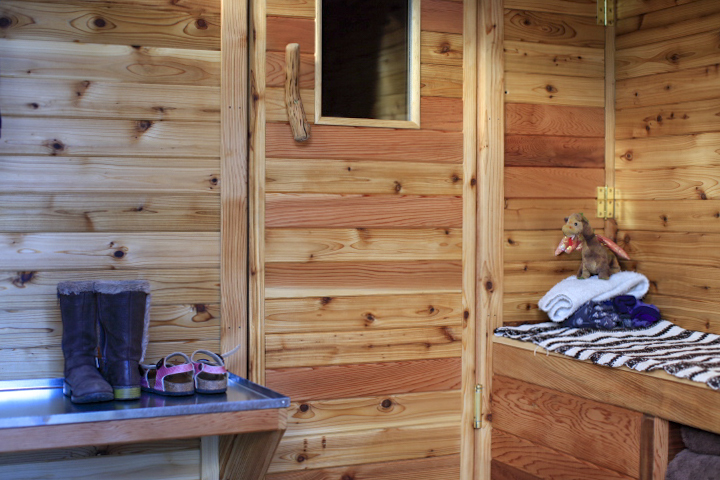 The sauna room will accommodate up to eight persons comfortably. It is clad in clear cedar wood, and the benches and back rests are made of hypoallergenic basswood. 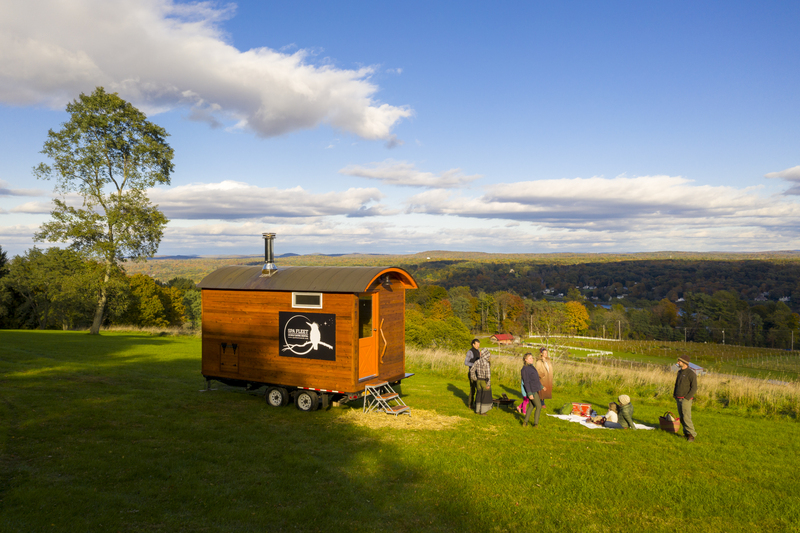 As a wood preserver we only use pure, food-grade mineral oil designed specifically for saunas and 100% free of toxins and allergens. Changing-color sauna light, which you can program with a one-touch button to select different modes of cycling through the colors, or keep it set at the color and brightness of your choice. 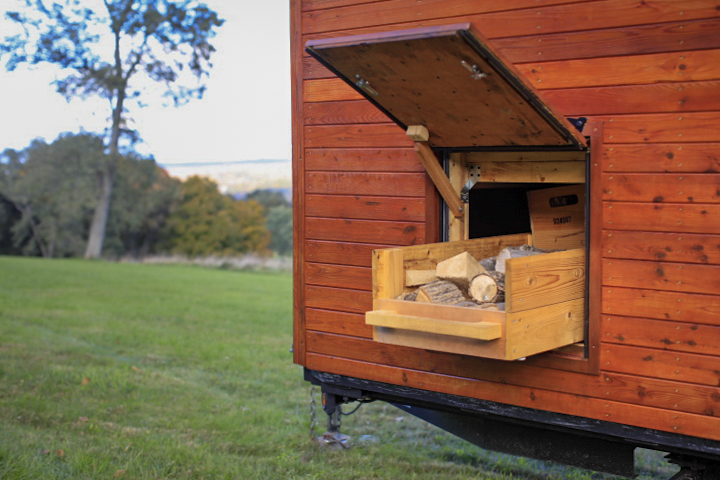 If you would like to supplement the crackling sounds of the fire with your own soundtrack then you may take advantage of the stereo speakers built into the sauna walls. Just bring a portable music player and connect it to the radio (located in the changing room) via Bluetooth or auxiliary cable. The changing room offers enough bench space to seat up to four persons at a time. There are two shoe racks and many coat and towel hooks, but it is always best to bring only your sauna essentials with you. LED lights in the changing room are dimmable, and there are two openable windows for all your fresh air needs. Leading you up into the changing room we provide a heavy-duty steel step-stand and a sturdy handrail. There is an exterior light above the entrance door, as well as a set of remote-controled under-trailer lights that gently illuminate the paths around the entrance area. 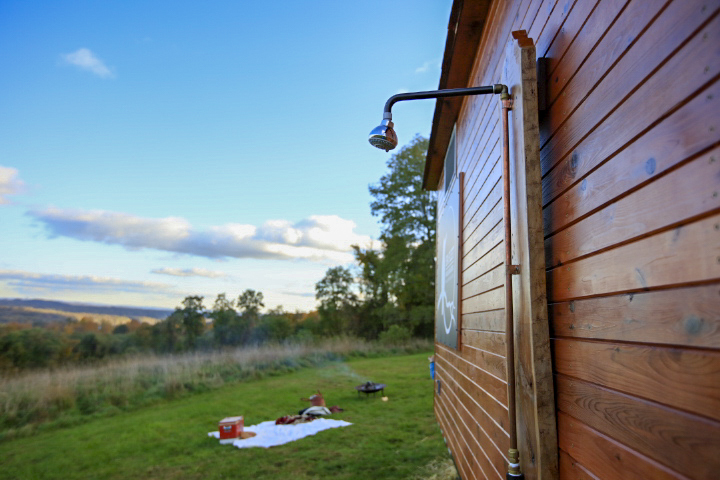 In temperatures above 35°F we are pleased to provide a removable shower head, which we will mount to the side of the sauna. This shower can be fed by a common garden hose. The safety of our customers is very important to us. We will explain to you in detail all the features and how to use them in our written User Manual, as well as in person when we deliver the equipment. 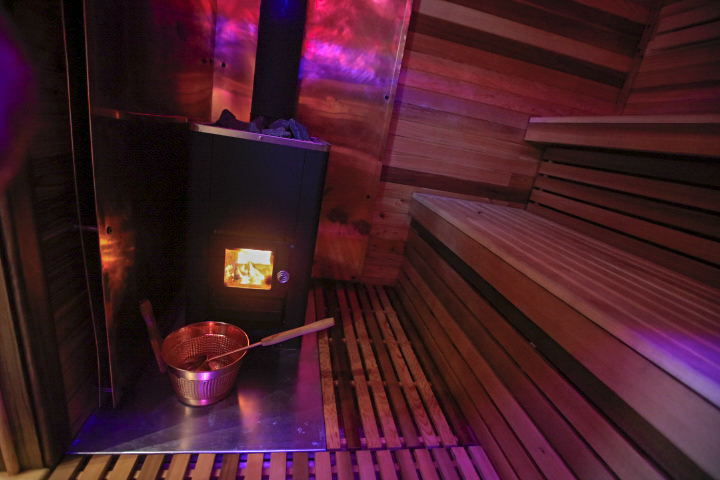 No prior experience is necessary to safely operate the wood stove or any other part of the Cloudberry sauna. The sauna door opens out to the changing room and there is no locking mechanism that would prevent the sauna bather from quick egress. Of course, we also provide a fire extinguisher, mounted in the changing room.